Razat is a very proactive with a great disposition to transform, innovate and improve the business processes. He always has a nice and friendly behavior, which eases the environment of work around him. He possesses demonstrated skills in business transformation, business development & successful execution with technical understanding. He is an enterprising person and will always strive for being the number one in whatever project he takes at hand. He has the ability to analyze and problem solve any complex situation/issue that comes his way with a strong vision. His journey started after he completed his MBA from Indore University. He gained ample experience as a marketing professional spanning seven years. He often approaches all things with extreme professionalism and thoughtful planning yet has a vein of creativity that enables him to unique solve problems with both pragmatism and imagination. The same was true when he decided to launch his own startup Freshler, an online food ordering service in Gurgaon. 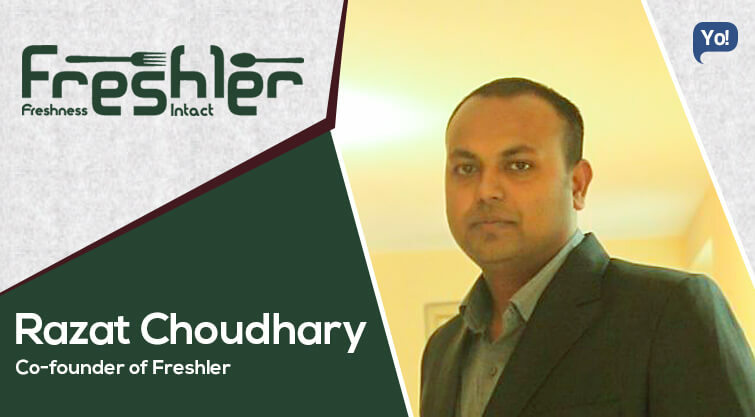 Freshler is Gurgaon Based Online Healthy fast food seller aimed to bring healthy and tasty fast food to consumer in most transparent way. Food Vertical ranges from healthy Salads, Burgers, Sandwiches & Beverages. Overall we want to improve consumer experience and so we are trying to use different methods to connect with customer. May it be food taste, personal message on packaging and connecting to consumer over whatsapp. I have couple of reasons which helped in building above Product. 1. Always wanted to work independently and be responsible for success and failure. 2. My Time in Argentina where i saw multiple food outlets in almost all Blocks and most of them doing very good business. 3. 1+ Billion Population of India is itself huge opportunity. You have one life so explore it to maximum. The first most Challenging Part was convincing our family to get relocated to India. Secondly of course putting right team and process with minimum fund available in our pockets. Challenges are meant to take head-on. We as a team have taken everything head-on as for us everything was new – New City…New Business Vertical and of course new ecosystem of startup. We are Self Funded till now. Motivated environment keeps thing healthy in startup. I have apps most of the food outlets so in my words use app as per your requirement. LinkediN should help in connecting with others. Never give and Keep moving. Trust thing will improve and if doesn’t it will give life time Learning. Take time to plan and work on Basics. Nobody will let you build your dream if you don’t take risk to make it. We want to take Freshler to 3-4 cities by 2016 so not thinking anything else beyond it. I would definitely take risk of starting my company during college.